I’m not sure if you are aware but I have been given an awesome opportunity to volunteer as a physiotherapist with Mercy Ships next year. For those who don’t know Mercy ships is a hospital on board a massive, gigantic, titanic ship. The advantage of having a fully functioning hospital on board a ship is that they are able to reach and provide a world-class medical service to the poorest of the poor nations on earth. Mercy ships are a Christian organisation that endeavors to follow the example of Jesus by bringing hope and healing to some of the world's poorest people. Mercy Ships is committed to alleviating human suffering and empowering them to stand on their own two feet and fulfill their God-given potential. I have always dreamt of going to Africa and helping those who have been born into poverty, starvation and a life with seemingly little hope for a bright future and words can’t express how excited I am about taking up this opportunity. The best thing about serving within such an organisation is that I am able to use my clinical skills as a physiotherapist on board. It will be very exciting and challenging time for me as I will be the sole physiotherapist in the hospital working in the orthopaedic, general surgical and medical wards. I will be volunteering for 3 months starting February 14th until May 14th next year while the ship is based in Togo (West Africa). Mercy ships are all about providing a quality service to those who can’t afford it and I am absolutely excited about volunteering on board. Apart from getting a lot of satisfaction out of volunteering within such an organisation, I have no doubt that I will become a better physiotherapist and leader being stretched in such a situation. The reason I am writing is that I am looking at raising money to enable me to serve on board. 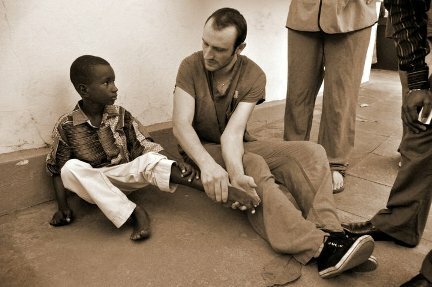 As Mercy ships is a volunteer organisation volunteers need to cover their own costs. For me this predominantly involves my flights to Togo and crew fees (food and board). The total cost I am looking at raising is $5375 and if there is even one dollar over I will be donating it to Mercy Ships. Just to let you know Mercy Ships is a tax deductable organisation, so for all you business savvy people out there you can claim any donations back as a tax deduction. I will have a going away party just before I leave and do the shave and wax then. If you or anyone you can think of is at all interested in donating anything at all to me please let me know and I can give you my specific Mercy ships payment details who will then redirect the funds back to me. Also could you please keep me in your prayers while I am away next year as Togo will be having their elections right when I arrive (how’s that for timing). Anyway during this time there is a lot of tension and a very real likelihood of street riots erupting.